One hundred fifty-two University of Notre Dame graduating seniors—many of them from the College of Arts and Letters—are embarking on a year or more of service in locations around the globe. 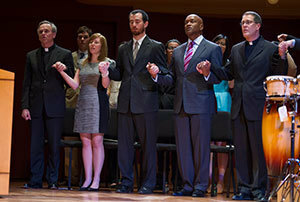 They were honored during the University’s annual Service Send-Off ceremony on Saturday, May 17 in the DeBartolo Performing Arts Center’s Leighton Concert Hall. Nearly a third of the graduates will join the Alliance for Catholic Education or programs that share its model to serve as educators in the nation’s Catholic schools. Others will serve in City Year, the Peace Corps, and Teach for America. And others will mentor orphans in Africa, Latin America, and the Caribbean; work to break the cycle of child abuse; or repair substandard housing in Appalachia. Still others will advocate for the rights of workers in the Southwest, foster spiritual formation in the nation’s parishes, or provide a host of other services that match the mission of Notre Dame. Rev. John I. Jenkins, C.S.C., president of the University of Notre Dame, commended the seniors for their commitment to service. Also speaking at the event were Annie Selak, rector for Walsh Hall, whose postgraduate experience included work through the Jesuit Volunteer Corps at Alternatives for Girls in Detroit, and Arts and Letters alumnus Terry Fitzgibbons ’04, rector in Duncan Hall, whose post-graduate experiences included teaching in Uganda through the Congregation of Holy Cross Overseas Lay Ministry Program. They offered the gathered students a joint reflection on how their service experiences transformed their lives and urged students to make the most of the life-changing journeys on which they are about to embark. Three outstanding students were selected to introduce the speakers. They included Jonathan Schommer ’14, a Program of Liberal Studies and civil engineering major in the Reilly Arts and Letters/Engineering Dual-Degree Program, who will participate in Notre Dame’s ESTEEM (Engineering, Science & Technology Entrepreneurship Excellence Masters) program next year; Jiyeon Ahn ’14, who will serve with Farm of the Child in Honduras; and biology major Yuko Gruber ’14, who will serve with L’Arche in Washington, D.C.. Many of the graduates became involved in service and social action through the programs and courses of the Center for Social Concerns. They join a community of many thousands of Notre Dame alumni who have chosen postgraduate volunteer service since the center was founded in 1983. Originally published by John Guimond at news.nd.edu on May 19, 2014.